Blend up your own avocado smoothie recipes! 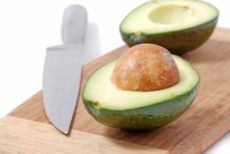 Learn how to blend up your own avocado recipes and receive the benefits of avocado in your diet. The idea of using avocados in smoothies came from Asia. This deliciously creamy smoothie is extremely popular. The creamy texture of the avocado is a perfect substitute for a banana in a smoothie. I generally use 1/4 to 1/2 of an avocado in place of one banana. Top tip for using avocado in your smoothies is to make sure that your avocado is ripe. The avocados should be dark in color and give a little when you press on the skin. I like to cut it in half all around the seed. I twist the two halves in opposite directions and pull them apart. I then scoop out the soft buttery-like goodness into my blender. Avocados are great for kids and athletic people who need condensed calories. What better way to receive those calories but in healthy smoothie recipes! Pour the milk and water into the blender with the dates, avocado, and cacao on top. Blend. Add ice and blend until completely smooth.